Like many UK shooters, I have been through the rite of passage with a number of Ruger 10/22s, blinged up with various stocks, triggers, barrels et al. Although accurate, they were somehow never that satisfactory. I have owned a Southern Gun Company Speedmaster straight pull AR15 variant for some years and had come to like the ergonomics, accuracy and adaptability of the AR15 family. As more variants of .22LR ARs became available, I thought it was time to extend my Black Rifle ownership. Many hours of web searching and browsing later, and I was the owner of a very purposeful looking Ciener based AR15/M4rifle. Sadly, it turned out that I had a less than unsatisfactory experience with it. When it worked it was a cracking little rifle, but I was continually fiddling with spring lengths, polishing this, polishing that and replacing something else in an endeavour to make it work reliably. When it worked it was excellent, but it did not work more often than it did, failures to chamber rounds from the magazine, failures to fire and undemanded double taps being the order of the day. I began to look at alternatives, and it became clear from a lot of online research that the dedicated uppers from Tactical Solutions and Spike’s Tactical were the way forward. I thought the Ciener conversion was a fairly crude piece of engineering, effective enough when it worked but basic in materials and workmanship, very much the stop gap item it was designed as. Looking at available alternatives, the Tactical Solutions and Spike’s dedicated uppers were obviously second generation items, superior in design, materials and workmanship in comparison to the original Ciener based item. The deciding factor, as is often the case, what was available in the UK? Before buying the Ciener based rifle, I had talked to the helpful Angela at Spike’s with a view to personally importing a dedicated .22LR or even an upper receiver. However, the complexity of US export legislation meant this was a no go, a .22LR upper available in the USA with minimal control was a major headache to bring into the UK, and hence the UK sourced Ciener. Eventually the Ciener and I parted company, and my Tactical Solutions/Sabre Defence 22LR M4 arrived from North West Custom Parts in late January. The snow and ice of January prevented me from getting to the range sooner, but I managed a couple of chilly outings in late February. 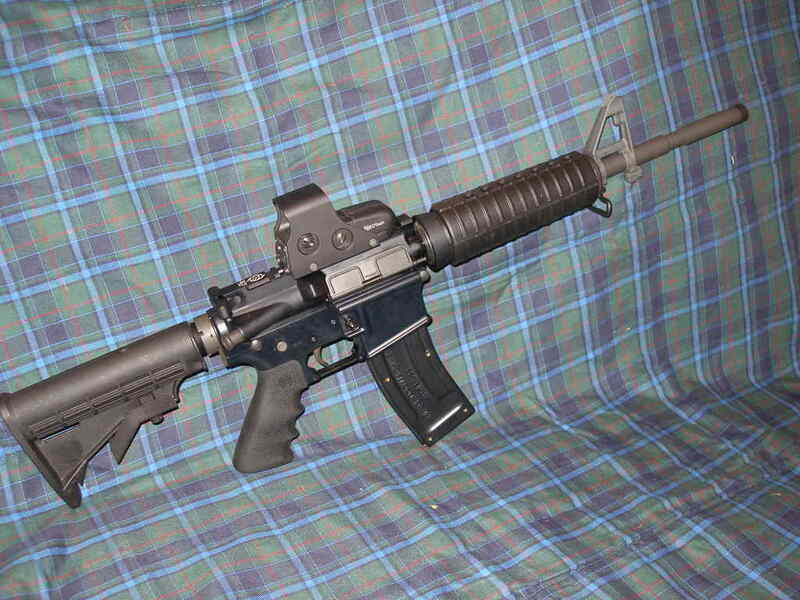 The specification of my rifle is by choice quite conservative. 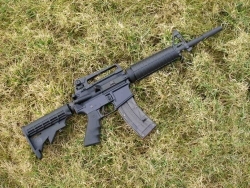 It is a standard Tactical Solutions AR15-M4 dedicated .22LR flat top upper with 16” barrel, threaded for a moderator or muzzle brake, and fitted with conventional hand guards. 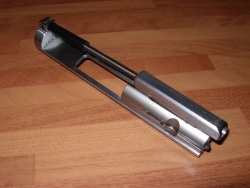 The lower is a MILSPEC Sabre Defence item, with a standard Sabre Defence telescopic stock and trigger group. A Hogue grip is fitted in place of the MILSPEC grip which I find a bit skinny, even though my hands are quite small. I have the same type of grip on my SGC Speedmaster .223 and find it very comfortable in use. The rifle is supplied with a Black Dog magazine, I have a couple of others and find them flawless in use. As a UK ex-serviceman of the L1A1 SLR generation I had always thought they were THE rifle I would want to have to hand if I ever really needed one. This rifle has really has brought home to me the virtues of the M4 carbine variants, it is a light, compact, handy and very capable rifle that will stow easily in a vehicle or aircraft, yet provide vastly more firepower and knockdown effect than an SMG of similar size: how many out there on the UK HTF remember the Sterling? This little rifle is very well balanced, light, points naturally and with the stock collapsed is very compact. The trigger is a bit on the heavy side, as would be expected from the standard military unit. Many of the reviews of AR15 .22Lr variants highlight that these rifles are ammunition sensitive, in that any one brand can produce a series of perfect X ring hits in one rifle, and be a total disaster in the next. As I had done with the Ciener, I set out with as many different brands of ammunition as I could get my hands on to see what would agree with this particular example. 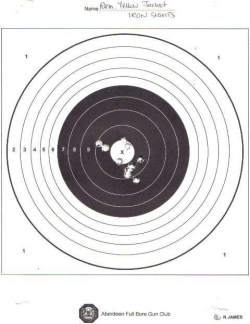 Although many semi-auto 22RF rifles need the extra power of a high velocity round to cycle the action reliably, In the UK we are not allowed to use hollow point hunting ammunition for target shooting events, which rules out using many of the widely available high velocity hollow point types. As has been discovered by many before me, a lot of .22LR target ammunition has bullets covered in thick, sticky gunge which while not a problem to a single shot Martini rifle, quickly gums up the action of a semi-auto. I found that several widely available Eley brands were not agreeable. Although they initially cycled well and were accurate, thick, dirty, waxy deposits were visible on the magazine follower and chamber feed ramp after 20 or 30 rounds and led to failures to chamber properly. Surprisingly, Eley Match and Match Semi-Auto were among the worst offenders. Eley Team was not a good performer, Lapua Master was a little improvement. After cleaning the ramp and chamber I tried Eley Target Rifle and Club, two of the cheapest of the Eley brands. They worked very well, and caused no visible deposits. Although not legal for competition use, hollow points can be fired on a UK range as part of a zeroing or evaluation process. CCI Min Mags and Winchester Lazers fed and cycled well, however the best results were achieved with Remington Yellow Jacket high velocity. These rounds have an unusual truncated cone bullet shape, and are dry lubricated. They fed and cycled very crisply, no failures were experienced in the 80 or so rounds fired. Winchester and Remington sub-sonics were a bonus success, a lot of semi-autos are reported as not cycling sub-sonics reliably, but they worked well in this case. It is clear that the most suitable ammunition for my rifle, and a lot of others out there, is a clean, dry lubricated type. Many USA based users of .22LR types report that Wal-Mart and Federal bulk ammunition works well, however to the best of my knowledge neither is available in the UK, certainly not anywhere near Aberdeen. 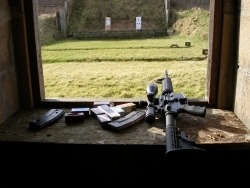 I tried the rifle with the Bushnell Elite scope and quick release mount from my Speedmaster, an Eotech red dot and standard iron sights at 25 yards with at best elbows on a bench resisting a stiff breeze. 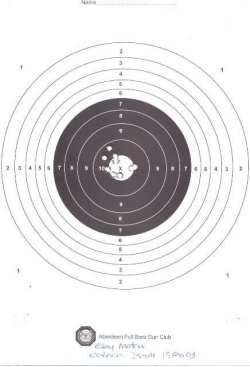 The limitations of the trigger become evident when trying to shoot what for me passes for precision, the sight picture begins to wave and blur as you fight the trigger pressure. 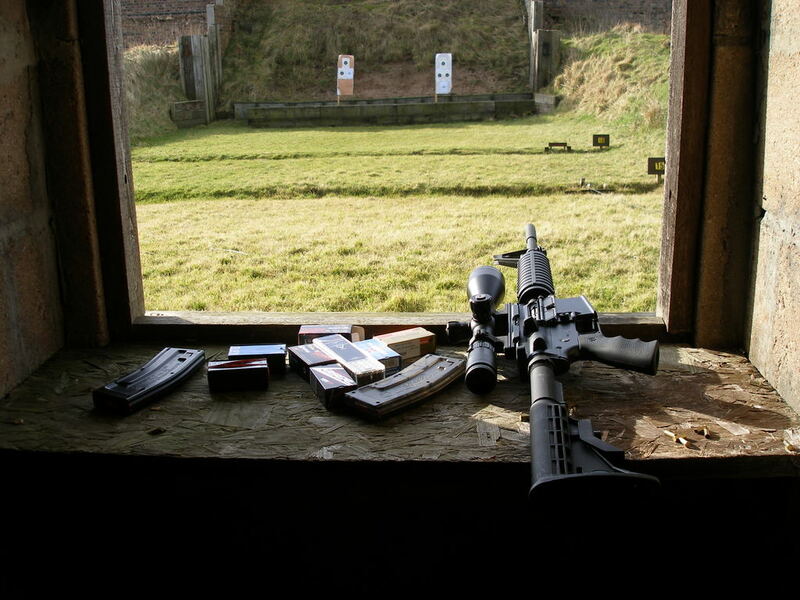 With the Eotech and irons, it is a more tactical experience, in fact what the rifle was made for. Grab the sight picture and snap the shot with a firm action. In terms of accuracy, this rifle can shoot better than I can. I make no claims to being a steely eyed ace marksman, but it is fair to say that this rifle can perform. Most .22 LR rifles are inherently accurate, but this one achieved with three different sighting systems, first time out. I probably went through 300 rounds or so, there were three or four failures to chamber, all easily identifiable as due to a dirty feed ramp or chamber. I did not experience any failures of a properly chambered round to fire, quite an improvement on my dismal Ciener experience. There is an evident Ciener family resemblance to the bolt, but the improved design, quality of materials and manufacture is clearly second generation and far superior. The area most demanding of improvement is the trigger. This is a known problem area with .22LR AR15 types, although I knew that the .22LR round needs a hefty smack from the firing pin to set it off, I did not know until I started trying to sort the Ciener that it needs more of a blow than a centre fire round. As a consequence some after market triggers won’t work on some .22LR rifles: it can be a difficult decision if you can only spend the money once. I will get through a few thousand rounds and let the rifle run in a little before trying a couple of easy options such as a lighter trigger spring before making any expensive decisions. The Black Dog magazines are excellent, high quality and reliable. Black Dog Machine Tool and Tactical Solutions have recently joined forces. They will be a formidable team, Tactical Solutions manufacture a range of barrels and conversions for the 10/22, Browning Buckmark and also a .22 conversion for the 1911, so lots of scope for Black Dog to diversify into other firearms. 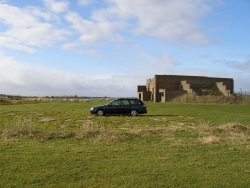 The new Black Dog magazines have a longer follower which provides a last round hold open facility. All in all, after a couple of short winter afternoons and a few hundred rounds I am hooked. If you are sitting on the fence and thinking about a 22LR AR, get down off it and go and buy one! There are a number of options now available in the UK, and you don’t need to spend any more than you will for a reasonably well modified 10/22. And even in winter, sometimes the sun shines in Aberdeenshire.